Ever since my Reevu helmet with integrated rear-view mirror cracked in multiple places due to multiple crashes during the 2008 Tour Divide, I’ve been looking for a new bicycle mirror solution. The Reevu cycling helmet, unfortunately, was discontinued due to poor sales in Europe and not being CPSC- or Snell-certified for sale in the U.S., so I had to find something completely different. I tried eyeglass- and helmet-mounted “Third Eye” mirrors, but they were too small and prone to being moved by airflow at high speeds. Brake hood-mounted mirrors proved to be even worse: too large and non-aerodynamic and still prone to movement. Not to mention they were quite Fred-like, the pocket protector accessory for bicyclists. 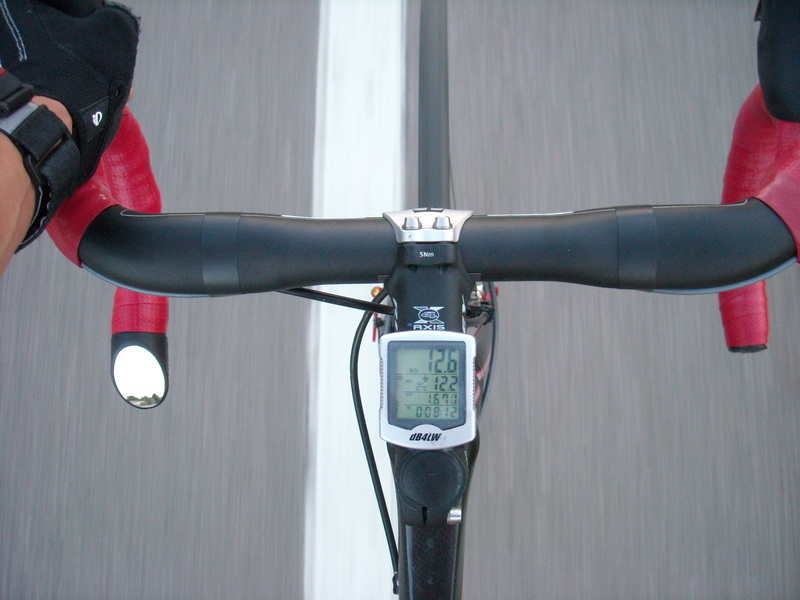 By process of elimination, mirrors that installed on the drops of the handlebars was the way to go. And I believe I have found the best one. The mirror is the $30 Italian Road Bike Mirror (eBay affiliate link). Below is a photo on of it installed. Note that it is so well integrated and aerodynamic that it is even stealthy enough for the Super Bike. As it is non-adjustable, once you get it set in the correct position and secure it, it will never move. Then it’s just a matter of glancing down to see behind you. The mirror is made of convex glass, and the optical quality is superb. There is no fuzziness or distortion that sometimes occurs with plastic mirrors. 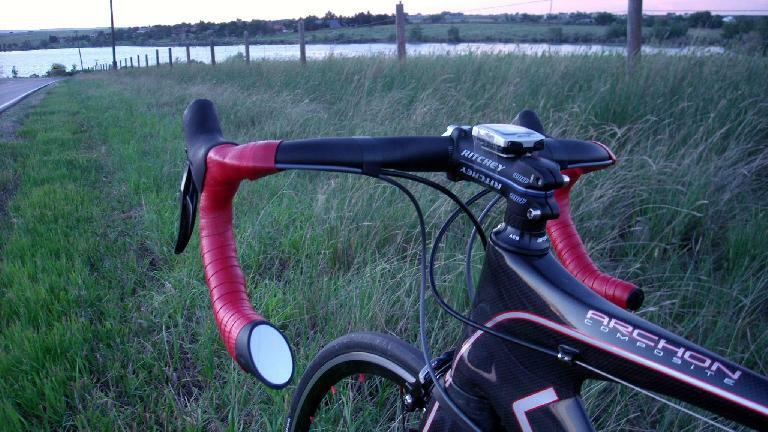 Unwrap your left-side handlebar tape. Slide on the mirror onto the left-side handlebar drops. The mirror body has four rubber “arms” that will rest around the handlebar. Use just a little bit of electrical tape to temporarily secure the mirror. Do not rewrap the handlebar yet. 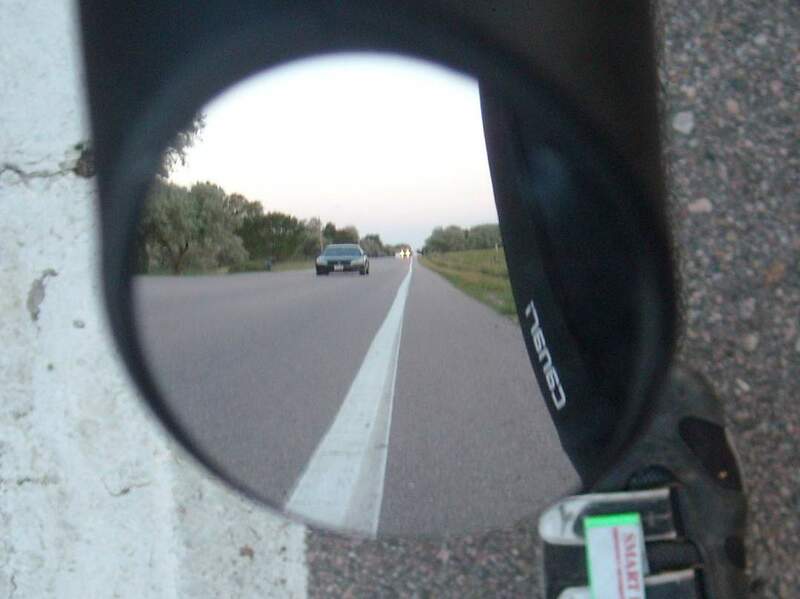 Hop on your bike, ride on the road, and check how well the mirror is oriented. While riding from either the hoods or the drops, you should be able to see the outside of your thigh in the far right of the mirror, and a car in the road, say, 50-1000 feet behind you would be in the center. You should not have to move your body at all, except your head or eyeballs, to glance down at the mirror and see a car. Reposition the mirror until its position is satisfactory as described in Step 4. Now secure the mirror permanently with lots of electrical tape. Rewrap the handlebar with handlebar tape. If you installed and positioned the mirror well, the view should look like this whenever you glance down at it. This is an actual photo I took while stopped, but it would look just like this when you are riding. The mirror weighs 60g (0.13 pounds). This is about 20g (0.7 ounces) more than some plastic bar end mirrors that are adjustable, but its glass construction and resultant superior optical quality, slightly smaller size for greater stealthiness, and never moving out of place—even when you lean that side of the handlebars against a wall—wins out in my book. In conclusion, the Italian Road Bike Mirror (eBay affiliate link) is the best cycling mirror option I’ve tried or researched. I think it is even better than the aforementioned Reevu helmet rear-view mirror, which worked great but sometimes caused me to have to strain my neck upwards while riding the drops or aero bars in order for my vision of the road to not be obscured by the helmet visor. Thanks Felix for your review of the Italian Road Bike Mirror. I just heard about them and Googled it and your review came up. After reading your review I am confident it will be superior to helmet mounted mirror and will get one to try out. Hi Olaf, thanks for your comment. Please let me know how it works out for you. Proper setup is key, but once you have it set at an optimal angle, it works extremely well! I’ve used one for 2 years. It’s an essential piece of equipment. When I ride a bike without one, I’m constantly looking down (and finding no view of the road behind me). I feel nervous without it. Feels really essential for me too. Thanks for your comment! Hi, I first found this on Durian Riders web page,and I have to agree its the best there is,a little tricky to set up but its one of those gadgets that makes road riding a lot safer. Greg H.